Now, once you know what you have to do to apply, the first thing you have to do is pick what species you want your character to be! So I’ve put together a list of all the cute, and, um, not-so-cute creatures you could be! Now, these rules only apply to the World of Equestria RP. But in Free-for-All, you can play all kinds of fantastic creatures! For now, let’s start with ponies. Unfortunately, there are only four Alicorns allowed in the World of Equestria, the four Princesses! So, I’m sorry, but your original character can not be an Alicorn, or any kind of winged unicorn, if you want to play in the Mane RP I mean. But ponies aren’t the only creatures you can play! You can even play as some species that don't appear on our show! A few of those are shown here. We are also open to other creatures that could fit into the RP world! If you want to apply for something like a camel or a giraffe, feel free! The RP Helpers will take a look, and see how well your character might fit in. Now, I want to talk about my favorite subject: Animals! 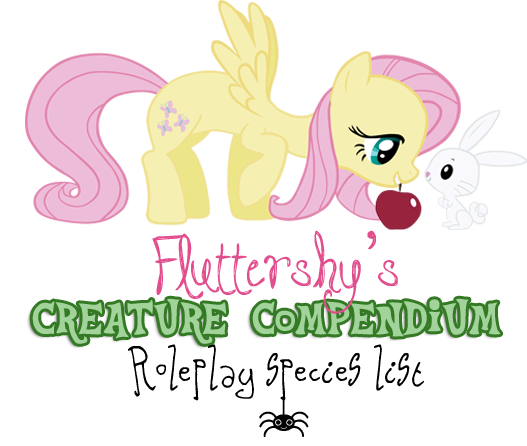 Your World of Equestria character can have a pet or ‘companion animal’ in the application. Animals can’t speak… well, I mean most ponies can’t understand them like I can, but they can be quite intelligent! It does mean, though, that most animals can’t be playable characters. You can, however, create a pet with their own personality, and include it in your character’s application! Angel Bunny joins me in a lot of role plays! But, just one thing: You really shouldn't have a large predator as a pet. So no wolves, or tigers, or any dangerous animals like that. Huge, gigantic, terrifying, enormous, teeth gnashing, sharp scale having, horn wearing, smoke snoring, could-totally-eat-a-pony-in-one-bite, totally all-grown-up Dragons. No Humans, Humanoids, Demons/Spirits, Aliens, Shape Shifters, Robots, etc. Now, if you have any questions about what kinds of characters you can play in the World of Equestria RP, or are just confused about the rules, you can contact one of the RP Helpers! They are all very nice ponies who will help you with your application! And, um, have fun in the role play!